Four very different nations with a shared past, the Four Stans, Kazakhstan, Uzbekistan, Kyrgyzstan and Turkmenistan, occupy the heart of Eurasia. Turkic nations with similar languages and a mutual history under the Soviet Union, these four countries have taken wildly different paths since independence. This popular route will take you through searing deserts and over high mountain passes. One moment you are horseback riding over mountain meadows in seclusion, the next moment arguing over prices at a bustling city market. You’ll go from catnapping in a nomad’s tent to unwinding in a luxurious B&B. 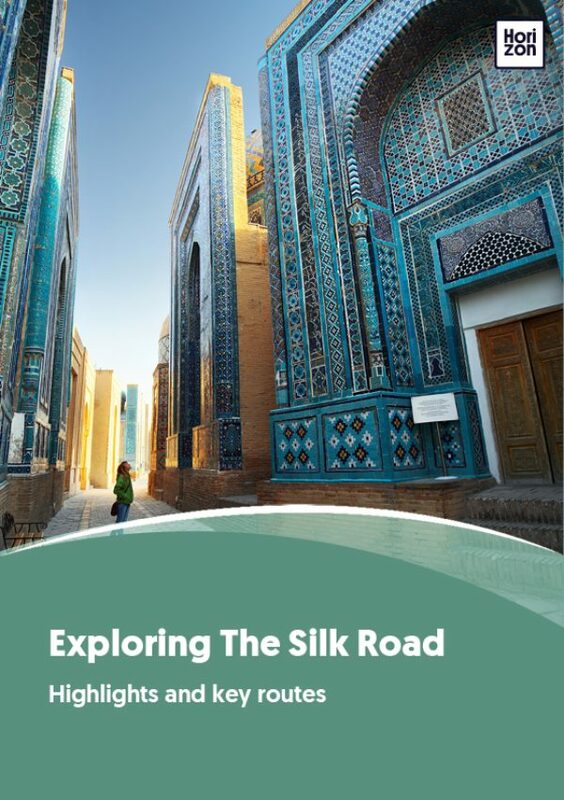 If you are unafraid to cover a lot of ground in a short amount of time and want to experience all that Central Asia has to offer: this is the route for you. Each tour operator organises their itineraries in slightly different ways, but most routes will cover the following highlights. You can, of course, elect to spend longer exploring any location along the way. You can easily spend a month getting to know Almaty, the former capital city of Kazakhstan, but most organised tours will spend at least two nights here. Popular highlights include Panfilov Park, with the massive monument to the fallen and the national instruments museum. The colourful Zenkov Cathedral is also located here, in arm’s reach of the city’s largest mosque. The Green Bazaar nearby forms the commercial heart of the city. To learn more, the National History museum offers a well-conceived introduction to Kazakhstan, while those with an artistic inclination will appreciate the Kasteev museum, the largest repository of fine arts in the country. Dining highlights include Zhety Kazyna, the town’s mainstay for authentic Kazakh cuisine in a sumptuous decor, and Alasha, for Uzbek classics in a garden-setting with an evening show. Georgian food is trending worldwide, and Almaty possibly boasts more than a hundred Georgian restaurants. Daredjani is the stand-out option. From Almaty the road to Karakol takes you past the scenic Charyn Canyon, Kolsai Lakes and the Karkara Valley, usually with a chance to stop for photos. You can reach Karakol in one day. Even better is to do it in two days, and overnight in a homestay halfway, at the tranquil Kolsai Lakes. Karakol, with its gingerbread houses and picturesque mountain backdrop begs to be explored further, but the road is still long (and no longer brand-new--you’ll need a 4WD for the next section). The next day, edge around the beaches of the shimmering Issyk-Kul lake, the second-biggest mountain lake in the world after Peru and Bolivia’s Lake Titicaca, and zigzag up towards Song Kol for a wondrous sunset. Most tours will spend two nights at Song Kol to give you the opportunity to really dive into the nomad lifestyle. Once refreshed, there is more spectacular mountain scenery as you navigate several high passes before descending down the Suusamyr Valley, populated by shepherds eager to sell you their kurd (balls of salty dried cheese). At the end of the day, Arslanbob’s squirrelled forest and waterfalls are your final mountain reprieve, before the heat and bustle of Uzbekistan wakes you from your reverie. Slow travellers will definitely want to spend an extra night here to revel in the natural beauty of the village. The colourful ceramic dishes and silk dresses you encounter driving through the flatland of the Ferghana Valley will make it clear: this is a different kind of Stan. Taking a train is comfortable, straightforward and high-speed, a welcome change from bending hairpins in Kyrgyzstan. Once across the border from Osh, your tour operator can take you either by train or private car through Ferghana Valley’s craft towns: Andijan, Rishton, Margilan and Kokand. From Kokand, it’s a quick scoot over the hills to Tashkent, where you can finally indulge again in hipster coffee and decent vegetarian food. Samarkand and Bukhara are now nearby. Don’t hurry through: as cultural capitals of the Silk Road, they deserve your attention and it’s worth spending several nights at each. From Bukhara, heading south will bring you to the border of Turkmenistan for the long desert drive to the ruined metropolis of Merv. After visiting Merv, you can continue along the desert highway or take a flight instead to Ashgabat, the final culture shock of an intense journey long in distance and dense in experiences. It is not easy to get into Turkmenistan. If you have the time, ask your tour operator if it’s possible to budget an extra day here, to relish the experience of wandering the capital. The warmth and beauty of the Turkmen people is something to be enjoyed. Flying out of Ashgabat, you get to see one final folly of the Turkmen regime: the brand-spanking new, shockingly underused airport, shaped like an eagle.